"I remember drooling over magazine screenshots for Rad Mobile, known back in 1991 as "that 32-bit arcade game WHOA MOMMA". I remember actually playing Rad Mobile and being impressed by that first intersection where I had to pass through cross-traffic, as well as the police car barricade . . . in which cruisers actually passed me and spun horizontally to bring my runaway radmobile to a halt." I remember drooling over magazine screenshots for Rad Mobile, known back in 1991 as "that 32-bit arcade game WHOA MOMMA". I remember actually playing Rad Mobile and being impressed by that first intersection where I had to pass through cross-traffic, as well as the police car barricade . . . in which cruisers actually passed me and spun horizontally to bring my runaway radmobile to a halt. I also remember driving on railroad tracks, desperately trying to outrun a speeding train. That was rad! Time hasn't been kind to those memories. The cross-traffic is simply there to remind players that the car has a brake pedal. The police barricade is a pre-determined obstacle; play the game twice and just stay in the proper lane. The train scene is actually one of Rad Mobile's easiest parts, since the tracks never make any sharp or surprising turns. 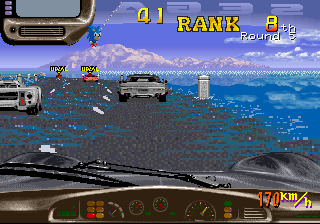 The game was intended as a 32-bit spectacle -- it's filled with "rad" visuals, but it's not much of a driving game, and it's even less of a racer. Sega clearly intended this to be OutRun for a new generation, but Rad Mobile tragically lacks all of the wonderful things that fellow staffer Sho reminded us about in his recent review: infectious music, tense drives, replayable course design, and a buxom blonde in the passenger seat. Decorated with palm trees (in Chicago) and caverns (in Indianapolis), Rad Mobile certainly had graphical flash, but 30 years of gaming history have proven that music makes a more lasting impression. I occasionally hum OutRun's magical melodies in the shower, but the only memorable sounds from Rad Mobile are the driver's outlandish hoots and hollers as the car goes airborne after a sharp incline. 32-bit visuals and a vocal driver could have made the game feel more intense, but victory is simply a matter of knowing when to switch lanes. Other vehicles always appear in the same place every time, so driving skill takes a backseat to good memory. Braking on turns isn't even required until almost halfway through the game's 20 (!) stages. Rival racers could have added an element of surprise, but they behave predictably; the otherwise-inferior Saturn port made the rivals feel like Highway Warriors out for blood (such as the infamous Rocky Mountain semi), but here they're all just out for a speedy Sunday drive. The game features a rear-view mirror, which could have been used to block dynamically tail-gating rivals. That would be racing . . . but that's not Rad Mobile. These games aren't always about racing -- sometimes they're about driving. Unfortunately, the driver-seat perspective and tendency to fishtail make the car's front end feel far heavier than it should. Even when accelerating, the weight distribution remained focused on the front. I'm not a car expert, so maybe that's realistic for this particular vehicle, but I've actually driven the radmobile's cross-country route (albeit much slower) and I'm glad I didn't do it in the radmobile. Since the game spans 20 sequential stages, most players won't even see half of Japan's insane mental image of the United States. I'll never understand why Sega chose this route instead of OutRun's selectable course structure. Since some of the middle stages are the toughest, it feels less like an epic and more like an uneven, overly-long chore. It may sound like I hate Rad Mobile, but that really isn't true. The game just can't hold up to the standards set by its predecessors, and it certainly can't match the great racers that came later. I did enjoy outrunning the police -- and I enjoyed their politically incorrect depiction. If the radmobile gets pulled over, an overweight policeman GUNS YOU DOWN. The unrealistic banked curves and rainy stages also add a bit of flair. Rad Mobile isn't terrible; it just isn't worth owning. When I win the lottery and purchase that Outrun faux-Ferrari chassis, I'll be installing it next to Sega Rally and Daytona. This one can just remain in my memories. If you enjoyed this Rad Mobile review, you're encouraged to discuss it with the author and with other members of the site's community. If you don't already have an HonestGamers account, you can sign up for one in a snap. Thank you for reading! None of the material contained within this site may be reproduced in any conceivable fashion without permission from the author(s) of said material. This site is not sponsored or endorsed by Nintendo, Sega, Sony, Microsoft, or any other such party. Rad Mobile is a registered trademark of its copyright holder. This site makes no claim to Rad Mobile, its characters, screenshots, artwork, music, or any intellectual property contained within. Opinions expressed on this site do not necessarily represent the opinion of site staff or sponsors. Staff and freelance reviews are typically written based on time spent with a retail review copy or review key for the game that is provided by its publisher.